When summer is hot there is no better way to beat it but by eating cold stuffs. Filipinos love cold snacks like Halo-halo or Banana con hielo for they are easy to make and are definitely delicious.But freshly made buko salad is certainly sinfully delicious. 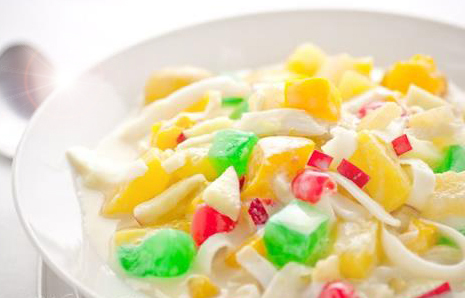 Buko salad is one of the Philippines delicious cool desserts that is a must have, especially in the hot summer months. Buko or young coconut meat is the main ingredient with sweet creamy dressing. It usually takes a good hour and a half to prepare and ready to eat but its worth the wait. Give it a try and enjoy. 1. In a mixing bowl, combine young coconut, kaong, nata de coco, pineapple chunks, and fruit cocktail. Gently stir to distribute the ingredients. 2. Add sweetened condensed milk and table cream. Mix until all the ingredients are properly distributed. 3. Refrigerate for at least 4 hours or place in the freezer for 1 hour. 4. Transfer to a serving bowl.